Designing your own custom BP Hand Truck double disc brake style hand truck has never been easier or cheaper! Handtrucks 2Go brings you the best price on a Build Your Own Liberator hand truck with a starting price of just $692.99, for the basic package. Extra charges for upgrades and optional accessories. Looking for a cheaper option? 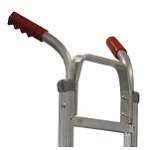 Consider the Liberator Tread Brake Hand Truck. Comes standard with stairclimbers and a kick bar which allows you to pull the hand truck out from under the load with ease (can be seen on hand truck that's on the right). Please note the style of the brake handle will vary based on the hadle that you choose. See examples in the hand trucks shown to the left. Automotive style dual disc brakes provide the ultimate in driver control and safety. Stop efforlessly even with the heaviest loads, even in rain, snow, mud or slush.Provides equal stopping power to both wheels for consistent braking action, with no pulling to the right or left. ** Please Note: The V-Style has Been Discontinued. • All new “ergo” brake handles increase leverage. More adjustable to individual hand size. • Better ergonomics for increased driver safety and efficiency.Wheel, extruded hub and brake rotor are bolted together as a single piece. • Precision bearing and a solid 3/4” axle. • Torture tested, the MOST durable brake available! • Loops are eliminated for more positive braking action. • Can be adjusted without removing. • Vinyl coated for corrosion resistance. • All new extruded wheel brackets. • Wheel/hub assemblies are on the outside of the brackets. Square loop-straight back, double vertical grips at 43 5/8". Straight top crossmember, two curved bottom crossmembers. With Sliding Keg Hook, Will Fit Any height Keg. Please Note: Keg Hook Is Only compatible with Frame B5 and B7. For Sankey Type 1/2 Barrel. Assists in unloading heavy cargo. I really like my bp handtruck w/disc brakes. Not really very fatigued at the end of the day from holding back heavy loads going down trlr ramps. Truck brakes aren't effected when wheels are wet from refer trlr floors like tread brakes. No wheel markings on customer floor like tread brakes scuffing wheels. The down side to the truck is that it is heavy with the extra mass of brakes. But at the end of the day it's great. Pretty much comes fully assembled. The customizable Liberator Double Disk Brake hand truck is great with the extra features â€“ we ordered with the optional stair climber and are so glad we did. Itâ€™s a life saver on your back! Anyone who does moving or handles heavy, fragile loads will appreciate this! Great product and awesome service!